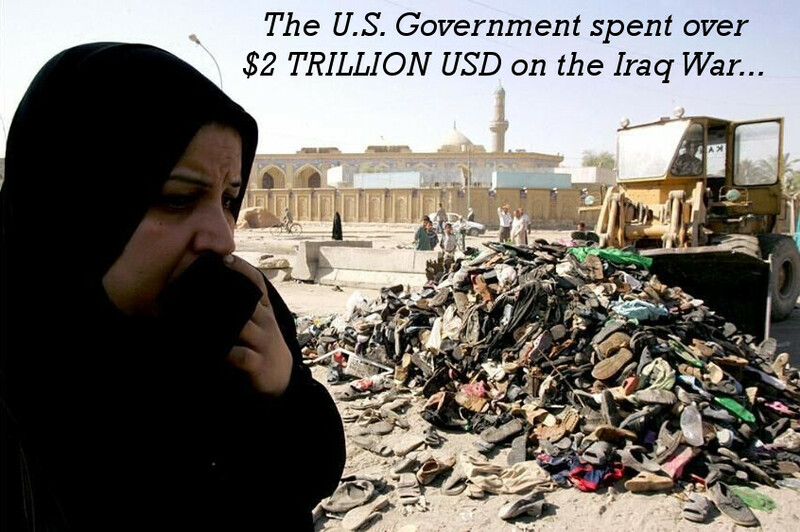 The recent Iraq War has cost the United States government, and thus the tax payers, an astonishing $2 TRILLION dollar(1)! But this figure grows even larger when included the interested that will be added, which over the next four decades will amount to a total of more than $6 trillion that the US tax payers have to pay off (1). But when accounting for the other wars in the Middle East, such as Afghanistan and Pakistan, this figure becomes $4.8 trillion, and by 2053, accounting for interest, will total over $7.9 trillion USD(2)! As astonishing as these figures are, which brings to question why the war was fought in the first place, and if there can be any justification for this amount of money to be spent, or more accurately placed the burden of paying on future American generations, but in fact this is not the worst part of the war. Millions of Iraqies have either died, injured or misplaced due to the war(3). Also, during the war, the use of depleted uranium shells to penetrate tank armour, has caused a toxic radioactive environment in many parts of Iraq, resulting in generation upon generation of human disease, death, and baby defects (4). The worst part is the mainstream media, especially in the United States, fails to discuss these results of war as clearly as possible, because if they did, there would be a call to criminal investigation upon all in power that argued for and lied about reasons for going to war.